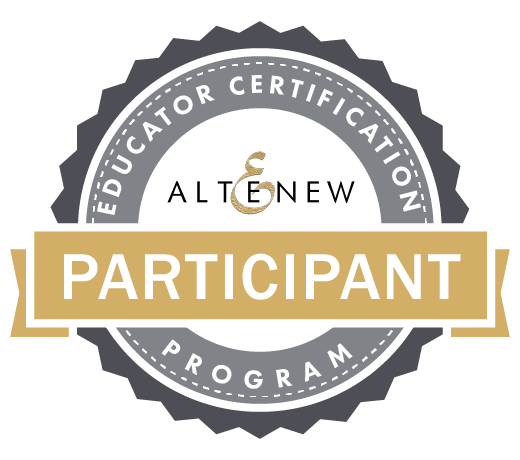 The Big Reveal: Spellbinders Happy + Gilded Age and a Giveaway! 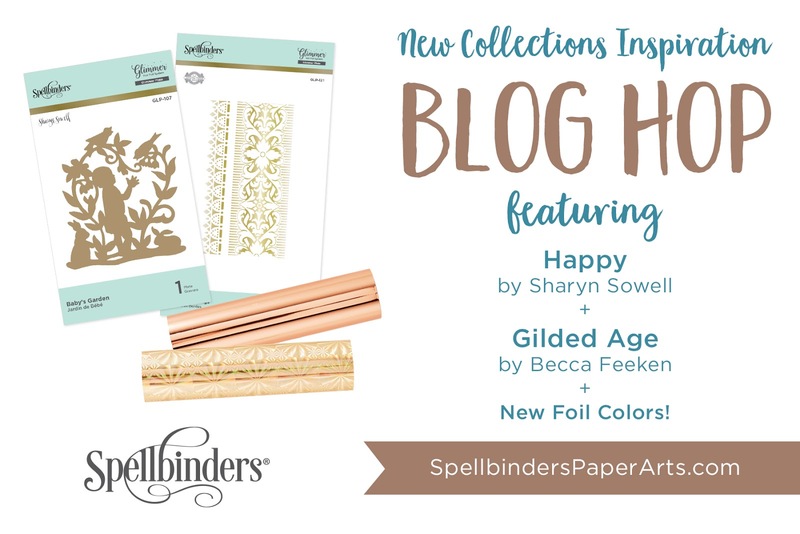 Spellbinders Happy + Gilded Age and a Giveaway! Hi there friends! Today I'm part of a blog hop introducing two new collections from Spellbinders! Both collections feature some awesome dies and also Glimmer Plates! You should have arrived here from the fantastic Laura Volpes blog. If you are starting here, the whole blog hop will be listed below. Be sure to read to the end to enter the giveway! My first card features products from both collections. I used the Celebrate with Cake die set and made a beautiful three layer cake complete with flowers. I also used the Gilded Nested Hot Foil set from the Gilded Age collection. These hot foil plates also have a companion die set (sold separately) The banner came from the Happy It's Your Day die set. These next two cards feature a technique that I have wanted to try, but never have. I used hot foil on my alcohol ink backgrounds, and OH MY....the results are stunning. I admit, I wasn't sure if putting the alcohol ink background on a hot foil plate was a good idea. But it worked awesomely! This card features the lovely Oh Happy Day Glimmer hot foil plate. I used the new Aura foil...and that is my new favorite! It shimmers and shines, and picks up color from everywhere. Every time I photographed it, the color changed...so cool! This last card features an absolutely stunning Gilded Vines Glimmer Hot Foil plate from Becca Feeken's Gilded Age collection. I used the black foil on my alcohol inked background....and as you can see, the card has maximum impact! Thank you for stopping by today! Be sure to comment to be entered to win a $50 Gift Certificate! Your next stop is Melody Rupple. Three awesome cards. I love the pastel cake card and the bold colors for the other two cards. Fabulous cards. I love the cake! Sweet cake card I like the foil border...the bird and frame turned out really nice..
Oh, I love those layers on the birthday cake with the cute flowers! The foil birds and branches are so pretty! Lovely cards especially like the birthday cake. The glimmer foil really adds to the cards. I love all your cards. The last one is so vibrant! So elegant. I love your cards! So much creativity!! Love them all! Such fun and elegant cards! Your rocked this release! Lovely cards, my favorite is the cake, grey and pink are so pretty together. Awesome cards. The black foil on alcohol inks is so vivid! I especially like the cake. The details are wonderful. Like the You're Amazing card. Wow! I must try your technique using Foil on the alcohol ink background! Wonderful cards, all of them! Love the cake card and the use of the rectangles for a border. Using the foil on your alcohol ink backgrounds was a great idea; love the way they turned out. Gorgeous cards, you nailed them!! Cool inspiration. I love all three cards, but my most favorite one is the cake. Gotta get that die. Thanks for sharing. Great cards! Each one had such pretty foiled details. What fun cards! I especially like the birthday cake. Wow.....they are all so pretty but my favorite is the last one with the black foil on that stunning background. Thank you for sharing. AMAZING! I Love the cake and I love the bright vivid colors of the last one! Pretty cards! Thanks for the chance to win. Three gorgeous cards that are so magically illuminating foiled cards! You are so creative and love how you pulled other fabulous Spellbinder's dies!! Loven' your inspiration! Your birthday cake card "takes the cake". Love the colors on this card. Wow, those alcohol ink backgrounds are amazing. Love the look of the foil on them. Really great. Gorgeous cards! Love the one with the inked background. Birthday cards are the design I make the most of, so happy to see your lovely cake card with the foiled rectangle border. Thank you for trying alcohol inked backgrounds under the hot foil. It looks amazing! Loving the new colors of foil too. Beautiful cards! I really love the Gilded Vines especially with the dramatic black foil. Gorgeous! Awesome cards using the new products. I love those birdies. Loved this black foiling...thanks for sharing!! Thanks so much for being so creative with the designs I snipped with my scissors. It's really fun to see how you used them so beautifully. All three cards are beautiful. I can see why you love the Aurora foil - the shifting of colors is breathtaking! Love the first two cards. These are fantastic! I just love the cake and bird cards. Those rectangle dies look wonderful with the cake-so elegant! I would love to know how you did the different foils on the bird card. That technique looks lovely. The birthday cake card is so sweet & pretty & I think you Rocked It with the next two cards using foils on alcohol ink backgrounds. Good for you for thinking outside the box & trying it. They are my very favourite cards I've seen yet!! Love the loose background colours! Thanks so much! Just started collecting alcohol inks and they are so much fun to play with. Love your cards and that cute birthday die! Lovely card card and great backgrounds. What a fun post filled with beautiful cards! All three cards are wonderful! LOve your cards! You've shown us great ways to use foil! You also are great with colors! Love the bright, bold last card! Awesome cards!! Thank you for sharing. Fabulous cards! The cake set of dies is a favorite! Beautiful cards and such fabulously creative inspiration using the new products. Awesome cards! Three awesome cards, but I love, love the birthday cake card. Thanks for your inspiration and Spellbinders. Really gorgeous and inspiring cards. Love the soft hues of the first card. My favourite is the third card with its bold colours and the beautiful frame. Loved your cards; especially enjoyed the colors on the bird card. Wow! Absolutely love the black foiling on the alcohol inked background! All of your cards are wonderful! I have never made a background with alcohol inks before. I think I must experiment! Thank you.